Surrounded by the Smoky Mountain trees, Cuddle Bear is an ideal cabin for romantic getaways for 2 or private retreats for families of 4. Semi-private and nestled in the Echota Resort, Cuddle Bear offers a peaceful, quiet atmosphere for your Pigeon Forge stay. Inside this cozy cabin, enjoy 1 bedroom, 1 bathroom, and sleeping space for 4. 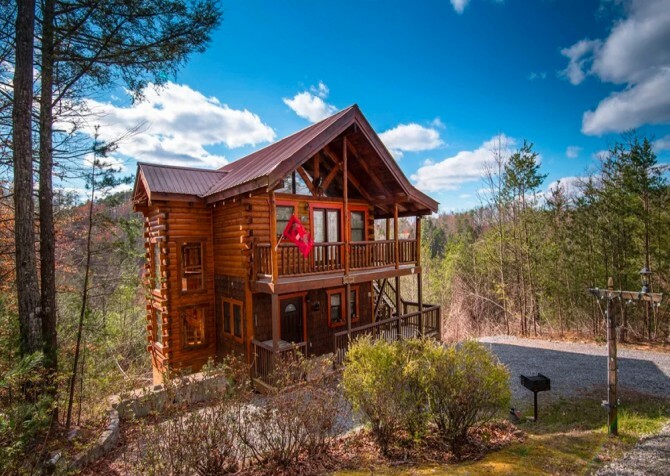 Plan your Pigeon Forge honeymoon at this log cabin rental, or choose Cuddle Bear for your family’s favorite vacation spot. This cabin is ideally located less than 10 miles from downtown Pigeon Forge, and it’s even closer to a variety of family-friendly attractions, including WonderWorks and the Titanic Museum Attraction. For the days you choose to stay at the cabin, you’ll find tons of options for indoor and outdoor entertainment like a multigame arcade, an indoor jetted tub, an outdoor hot tub, and a big screen TV equipped with a DVD player. 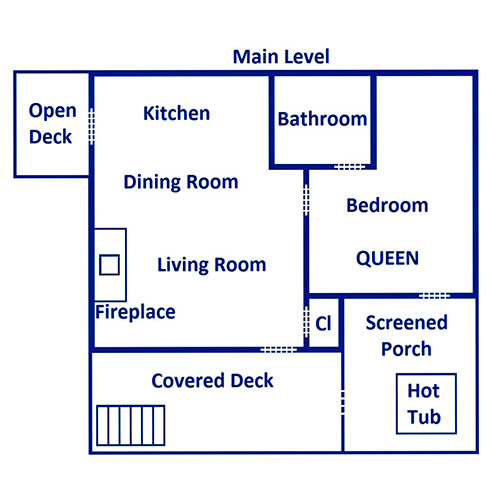 You can also plan for a romantic steak dinner or family barbecue using the gas grill on the porch, and on a cool afternoon, enjoy a pleasant walk through the woods that surround Cuddle Bear. 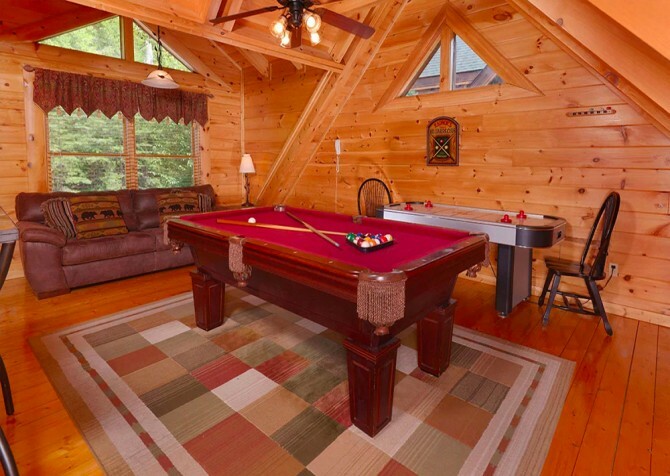 This 4-person cabin is an easy choice for relaxing and fun-filled vacations to Pigeon Forge! Whether you’re traveling with your family, your go-to couple, or the one you love, a cozy hangout spot like the living room inside Cuddle Bear is a necessity! After shopping in Pigeon Forge or spending the day checking out the shops and restaurants by the historic Old Mill, this living room provides all the comfort and entertainment you need to relax and unwind. Enjoy a large sectional, a coffee table for drinks and snacks, and Smoky Mountain décor all around, including an antler chandelier overhead. This room also provides a large flatscreen TV equipped with a DVD player. Bring your favorite DVDs for an in-cabin movie night in your PJs with popcorn and hot cocoa – what a way to spend a Smoky Mountain evening. A gas fireplace provides warmth on those chilly mountain evenings, especially if you’re visiting the Smokies in late fall or winter. And if the kids (or kids are heart) are looking for something fun to do on a rainy day, don’t miss the multigame arcade in the corner! 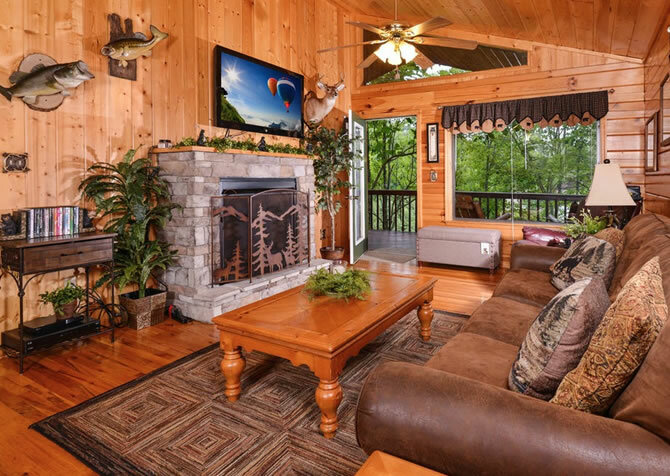 This large living room provides plenty of options for comfort and entertainment in the Smokies. You’ll find the essentials for making homemade meals in the Smokies right inside your inviting kitchen in Cuddle Bear! The L-shaped kitchen is open enough for several people to cook at the same time. Major appliances in black and stainless steel – a refrigerator, dishwasher, stove/oven, and microwave – elevate the look of this rustic and cozy kitchen, blending modern with classic. Plus, you’ll have countertop essentials like a coffeemaker and knife set, along with enough dishes, glasses, and utensils for everyone to eat together. Before you arrive to the cabin, we recommend a stop at The Apple Barn General Store in Sevierville, where you’ll find tons of locally made goodies for breakfast, brunch, or a late-night snack. Be sure to stock up on microwave popcorn, hot chocolate packets, your favorite coffee blend, and a variety of snacks for your stay as well. Cuddle Bear makes it easy to prepare meals, reheat leftovers, store cold drinks, or whatever else your group might need during your Pigeon Forge stay. It’s so cozy, you might not want to leave! Between the living room and kitchen is Cuddle’s Bear quaint dining area—a 4-person table that’s ideal for drinking coffee, sharing a homemade meal, or swapping stories while sharing a fresh-baked apple pie on a cool Smoky Mountain evening. This table can also function as your family’s game table or a card table for up to two couples. Although Pigeon Forge restaurants like Calhoun’s and No Way Jose’s Cantina are hard to beat when it comes to food, nothing will be as cozy and quaint as sharing a meal in your Pigeon Forge cabin. So be sure to plan for some home-cooked dinners or look for downtown restaurants that offer carry out. A few delicious options include Johnny Carino’s, Corky’s Ribs & BBQ, and Blue Moose Burgers & Wings. Cuddle Bear’s master bedroom features a queen-size bed set in a large log frame. It pairs perfectly with the log nightstands and rustic lamps, along with the dresser for easy storage while you’re away from home. With its own flatscreen TV and DVD player, this bedroom provides a comfortable space for you to watch your favorite shows or movies before bedtime, and its large jetted tub provides the perfect way to soak away stress or relieve sore muscles after hiking in the nearby Great Smoky Mountains National Park. Along with its master bedroom for two, Cuddle Bear provides a queen sleeper sofa for additional guests. In all, this cabin will comfortably accommodate up to 4 guests, making it ideal for a romantic escape or a single-family vacation. 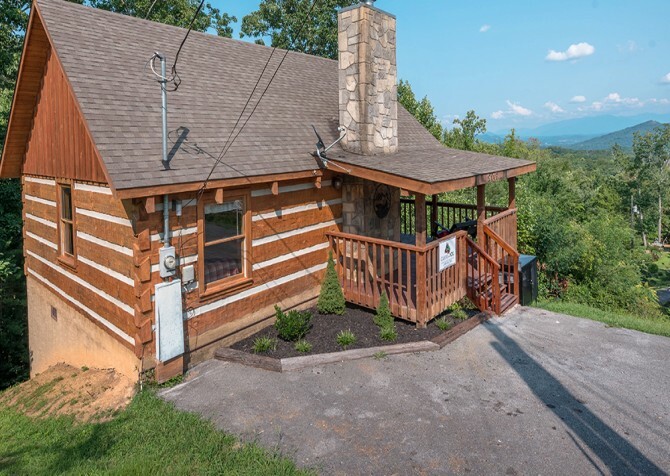 Nestled in the Echota Resort, which offers privacy and a safe area for walking, Cuddle Bear is a great cabin choice for those looking for wooded views and quiet, peaceful surroundings during their Pigeon Forge stay. Cozy porch furniture adorns the deck of this cabin, providing a place to sip on a glass of locally made wine or a refreshing cup of sweet iced tea on a hot summer afternoon. Cuddle Bear also provides an outdoor hot tub that’s screened-in for your comfort and privacy. Be sure to pack your bathing suit so you can make the most of your stay at Cuddle Bear! On a separate deck, enjoy a gas grill for those perfectly marinated steaks, burgers, or kabobs during your visit to the Smoky Mountains. And if you’re planning a special occasion, let us help by marinating and delivering the steaks to your cabin door. Ask our reservation specialists today about our Honeymoon Special and many other vacation packages for our Cabins for YOU guests. Along with all the fun and relaxing amenities already listed, Cuddle Bear provides a CD player in the kitchen and a convenient computer desk equipped with high speed Wi-Fi. That means you can stay on top of emails, your Facebook account, and our CFY blog during your stay in the Smokies! Cuddle Bear also provides access to a washer and dryer so you can stay on top of laundry and avoid returning home with a long list of chores to conquer. Finally, Cuddle Bear offers a flat driveway with parking spaces for up to 3 cars. Roads to the cabin are also flat and paved, making access to this mountain cabin easy no matter when you plan your Pigeon Forge visit. Open year-round, this zoo features more than 600 live animals representing more than 130 species! Come check out their wildlife, educational activities, and petting zoo area today. Looking for some action in the Smokies? This family-friendly amusement park features go-karts, bumper boats, mini golf, and arcade games galore! You can’t miss this upside-down attraction in Pigeon Forge, which offers multiple indoor WonderZones that make education fun for kids of all ages!